Inevitably, unsurprisingly, and predictably – Odessa is to be the first Oblast to produce an effective, efficient, bribe/corruption free 1 Stop Shop for business administration – or at least that is the plan. The Minister of Justice of Ukraine Pavel Petrenko, Head of Odessa Regional State Administration Mikheil Saakashvili, Mayor of Odessa Gennady Trukhanov and Victor Lyakh of the NGO “Shidna” signing a memorandum of understanding that will create this administrative node. The centre, however, does not open until October – This, presumably for two reasons. The first and most obvious reason, being political. It seems likely to be timed immediately prior to the local elections for maximum electoral and business constituency voter effect. “Delivering upon anti-corruption, reducing bureaucracy, promoting SMEs, “decentralisation”, customer service” and all that nice vote winning rhetoric will pour forth just prior to the local elections in late October. No wonder Mayor Trukhanov is publicly “on-side” for this collaborative effort between City and Oblast. The second reason for the birth of this administrative node however, being legislative. There is no room for administrative maneuvering in the provinces without the centre passing laws to provide that room. Therefore something so simple as putting all the business administrative organs under a single roof – or at least client facing administrators from all business administrative organs – under the same roof (time will tell). This seemingly under the watchful public eye of “Shidna” NGO, the media, business people, entrepreneurs, and others. This administrative node requires such “decentralising” legislation to be passed. With constitutional amendments that would allow for such “decentralisation” being somewhat glacial, and with nobody really knowing what “decentralisation” will be precisely, October would seem to be the earliest realistic date. Should such legislation not be passed, then the institutional mandarins will remain within their fortified, obstructive and insular institutions – for no laws will exist to allow them to mingle with the other relevant institutions for business administration under the same roof, or in the same room, and heaven forbid, as part of a functioning “real time” administrative process. How entirely un-Soviet! How absurdly un-Ukrainian! Spending days, weeks and months, going from one administrative building to another, and then another, and back again, and forth again, and around in circles for a while, is traditional – and the main source of low-level corruption within the State institutions where opportunity for graft knocks with every document in every institution. Can it really come to pass that client facing functionaries will be allowed to be the keepers of the official stamp? Moreover, can it be that not only will they be so empowered to be the keeper of the official stamp, but also the authorised signatory? Is that possible? Will it not overload the capacity of a lowly functionary? Could there even be a few such lowly client facing functionaries to allow for lunch breaks, illness and holidays? Can institutional chiefs become managers and no longer rulers zealously guarding the official stamps and leaving all dependent upon their signature? Too much! Lord! What if e-governance and e-administration allows the hoi polloi to complete documents on-line, make and attend appointments to made the process even swifter! The electorate could get carried away and start demanding entirely reasonable processes not only within business administration, but school registration, registration at a property, ID production and all sorts of sensible things. It may begin to have “expectations” instead of frustrations! However, we are currently only noting the signing of a memorandum – and which, with a fair wind, may actually lead to a centralised “something” by October. Just what that “something” will turn out to be, and just how useful, remains to be seen. This is an entry that has been waiting to be written for a long time. Much has been written about the short falls of Ukraine politically and institutionally. Much has been rightly criticised too. Much will continue to be written too, whilst ever-changing yet headline grabbing personnel rotation is used to mask the lack of reform. Indeed the continual turnover of Ukrainian interlocutors and institutional leadership is extremely problematic when it comes to building rapport and trust. Why invest time and effort into somebody that can be fully expected to have been replaced in a few months hence each and every time a new face appears? This entry however, is about the EU and its response within Ukraine rather than the EU response from without Ukraine. The EU has responded in the usual EU way. The EU way has been criticised for not doing enough, or arriving long after the stable door was found to be swinging and not horse was in sight over several critical and headline grabbing issues. However a 28 headed hydra (plus 3 EU institutional heads) drives any consensus-driven response to the lowest common denominator by default and will always be less than timely. By nature is is reactionary and glacial. But the EU way is far more than belated and proportionally questionable sanctions. It is more than an EaP that is in dire need of restructuring due to the policy no longer being fit for the times. Indeed for Georgia, Moldova and Ukraine that have ratified legally binding AA/DCFTA agreements, the frameworks within those documents make the EaP more or less irrelevant without a serious and meaningful policy review. It is far more than political, diplomatic and financial aid, or the tinkering with/delaying of/expedited introduction of agreements. It is also far more than the no PR projects that have gone on and continue to go on across Ukraine over many years. However, this entry is more orientated to the reform and “western integration” processes, and thus the EU actions within Ukraine, rather than those EU actions outside Ukraine. As is the EU way, a dozen separate, stand-alone missions of technocrats, bureaucrats and secondment available diplomats – together with previously employed election monitors, NGO participants etc., from various databases have been mobilised, this time as “field workers” amongst these dozen EU missions. It doesn’t really matter that the “field workers” are generally clueless about the intricacies and technicalities of their particular mission specifics. After all, as “field workers” they simply need to see the right people and accurately report upon what they see and hear. Policy shapers and makers they are not. Accuracy is the only attribute they need to have in abundance – that and a little history of understanding the “EU (bureaucratic) way”. Thus for example, a knowledge of law, or legal institutions, or legal processes, is not an overriding requirement when working within the EU “rule of law” mission in the provinces. Accurate reporting from the Ukrainian institutions they visit is what is expected. The same can be said of all other EU missions in Ukraine – those at the core of each stand-alone mission are undoubtedly competent with regard to the specifics and technicalities of the mission, know how to see the woods from the trees within the provincially produced reports, and produce documents (the EU way) to justify their existence, costs, suggest strategies, and identify successes and/or resistance they may have. This takes us to several core issues relating to the “EU way”, firstly with regard to the management and effectiveness of the “EU way”, and secondly how the “EU way” is seen through a provincial lens. Clearly a dozen stand-alone EU missions created and sent to Ukraine to either monitor, provide advice, or both, across the various areas of required reform carries with it a dozen sets of costs – and there must surely be savings in pooling clerical, administrative, HR roles “in country” that are undoubtedly not being pooled. The bureaucratically induced fiscal waste of a dozen stand-alone missions over 12 – 24 month (or longer) missions will be immense, not to mention unnecessary. The time will come when somebody in Brussels declares, either with pride in the event of successes or in defence of failures, that the EU has spent “Euro X millions” on a dozen or so missions in Ukraine. That a good deal of that money will have been wasted on duplicating administrative burdens a dozen times over will, naturally, not be mentioned. There are however several other more important issues than institutionally, unnecessarily wasted Euros by the millions. Sat in Kyiv is the EU Delegation to Ukraine, currently headed by Jan Tombinski. It is he that faces the Ukrainian diplomats and parliamentarians (as well as Ukrainian civil society) when they have “issues” or when the EU (rather than its Member States) have a message to be delivered. He is, in effect the “go to” man when it comes to the EU (and the “EU way”) for Ukrainians – and rightly so, for that is part of his role. However, it is absolutely certain that Mr Tombinski, should you visit him on any day, cannot tell anybody just what any of the stand-alone missions are doing, how far they have got, where they are going and what, if any, benchmarks have been met. Talking in broad brush strokes is fine, unless somebody is asking you about specifics that you are unable to answer, but expected to know – intimately! Some of the stand-alone missions have cross-cutting cleavages within their remits. If Mr Tombinksi is to meet with Minister X from Ministry Y, does it not pay to know the exact situation with the handful of stand-alone EU missions that have cross-cutting cleavages that fall within the remit of Minister X? How, exactly, can Mr Tombinski state that “this is on the table, and this is the way it will go” – or alternatively “this is not on the table, and this is why” when we can be guaranteed that he has no knowledge of which of the dozen EU stand-alone missions are doing what, where, how and with whom, the level of progress, and why one particular mission is further ahead in a specific cross-cutting cleavage area than the others. Another issue with cross-cutting cleavages within the remits of a dozen stand-alone EU missions is that the field workers attached to each stand-alone mission will therefore see some of the same provincial functionaries and politicos, time after time after time – without having any idea that their (estranged) colleagues were there the day before asking the same questions, and that tomorrow others will be there asking the same questions too. With the “field workers” having little to no in-depth knowledge of their own missions, let alone the others, when asked if they know “Mr/Miss X” that was here yesterday, or that is here tomorrow, they will look blank and say “no”. When asked what will be done with their accurate reporting, they will not be able to give particularly convincing answers. If questioned why so many EU mission people are asking the same questions, does it pay for the field worker to say “what other EU missions?” or “I don’t know”. The issue does not end there of course. There are then 28 EU Member States dealing bilaterally with Ukraine. Those 28 bilateral relationships may also duplicate some EU Mission works, or contradict, or rub against the EU stand-alone missions. Those bilaterals may often be preferred to the EU Missions on occasion too. Bilaterals, after all, are not subject to lowest common denominator consensus of 28 Member States, plus the 3 EU institutions. Impact and outcomes may be far more timely, far more focused, the parameters better defined, and the functionaries within far more knowledgeable. The bilateral interlocutors are likely to be far more knowledgeable about specifics than the EU “field workers”. Rightly we would expect a national diplomatic economics attache or junior mandarin to have a good deal better insight into economics and Ukrainian economics than somebody that has been hired by an EU Mission because they were an election observer once upon a time and were found on a database. Likewise, defence, security, rule of law, civil service, tax, customs, organised crime, and local government reform specialists from within the diplomat corps of a nation are going to be far more imposing, impressive and able to answer prickly questions far better than an EU Mission field worker. How does Mr Tombinksi explain to Minister X that his busy provincial staff are being asked exactly the same questions by a succession of EU personnel who apparently have no in-depth knowledge about what they ask, nor are they aware of their colleagues having visited/about to visit that same provincial functionary, and have no feedback to offer regarding previous visitors? How then can you convince the Ukrainian Minister, and perhaps more importantly the provincial staff, that the structural reforms that will be suggested by the EU once these missions are complete, will not result in a process as needlessly expensive, discombobulated and seemingly chaotic as the EU Missions in Ukraine currently appear? How do you convince the provincial mandarins and functionaries that despite the clearly dysfunctional appearance of the EU, nothing they say will fall between the cracks in the pavement and be lost from the discourse? This may be the only way a provincial mandarin will be heard by not only the EU but his own centre too. Should the EU, its numerous stand-alone missions and on-hire field workers, not project a far more efficient bureaucratic (and technocratic) image when their function is to monitor and recommend bureaucratic (and technocratic) effective reform? None of the above, however, means that any of the stand-alone EU Missions will fail to deliver (depending upon the definition of “failure”). What it does present, however, is the appearance of chaos, lack of discipline and “joined-up” reform management, communication issues and unnecessary financial waste. In short is projects an image that the EU collectively, is trying to convince Ukraine to leave behind by adopting the antithesis of that image through genuine, deep-rooted reform. The projected, yet discombobulated image very much undermines the expected ends. Thus there is a necessity for the EU and its stand-alone missions to get its own house in order administratively. It all has the appearance of being altogether too messy “in country”, when it need not be. An Odessa – Lviv reformist umbilical chord? A very short entry today, but one to ponder as it goes against all the current media noise relating to Andrie Sadovyi/Samopomich and Viltali Klitschko and UDAR is the issue of seemingly blossoming ties between Odessa and Lviv. They are but currently small acorns form which it remains to be seen if mighty oaks will grow. Your author last year put certain friends that are both functionaries and elected Oblast Rada members in contact with those within the Lviv City Administration over a specific issue. It was very much a case of joining the like-minded together and something that could and should have occurred without your author’s assistance. Except such regional interaction is actually few and far between. Indeed if central government and institutional management nationally is far from “joined-up”, then regional Oblast interaction bilaterally is next to zero. Lviv and Odessa however have many current political commonalities insomuch as both are willing guinea pigs for “pilot projects” in the provinces. Both now have, prima facie, forceful reformist leaderships. Whilst one of Andri Sadoviy’s right-hand men in Lviv, Sasha Kobzarev is an Odessa native and friend of your author for many years, Governor Saakashvili’s headline-grabbing advisor, Sasha Borovik, was born in Lviv. Indeed, in Odessa recently numerous Lviv restaurants and chocolate stores have begun to appear where once there were none. A few months ago, Lviv was the first city airport to bring in a policy approaching “open skies”, breaking the Kolomoisky UIA monopoly at the city airport. Odessa is about to become the second city to break that monopoly and welcome in the same policy as Lviv. One can only imagine the immense pressure that has been rightly brought to bear upon Mr Antoniuk, a former UIA employee and now Ministry of Transport mandarin charged with allocating air routes and to whom. Having defended Mr Kolomoisky’s interests for so long, he now appears to be crumbling under the provincial pressure of Messrs Sadoviy in Lviv and Saakashvili in Odessa, rather than the central pressure from Kyiv that he for so long withstood. Unemployment would appear to beckon for Mr Antoniuk imminently. Little appears to have been said, if indeed it is known within the media, about a few recent meetings between Messrs Sadoviy and Saakashvili. Perhaps given the history of Oblasts being wantonly isolationistic and zealously guarded islands by local elites, there is little imagination given to two robust reformers meeting a few times within a month of Mr Saakashvili’s appointment. After all, Mr Sadoviy heads Samopomich and Mr Saakashvili is the president’s man – except of course, Mr Saakashvili is his own man before he is the president’s man. It is perhaps why, when announcing the appointment of Mr Saakashvili as Governor, the President made a hardly noted comment that he expected Mr Saakashvili to deliver real results within a year of appointment – In short a “firing clause” was publicly announced at the same time as the appointment. “Results” is a very woolly term, particularly when it is the President that will benchmark them against unknown (if they even exist) criteria. If Mr Saakashvili’s options in returning to Georgian politics are unlikely to manifest themselves, and the definition of “results” is politically expedient for the President regarding his stay in Ukrainian politics under his patronage, then does it not pay to create linkage between two vitally important Ukrainian Oblasts for the benefit of the nation, and western/southwestern Ukraine as a region (the EU bordering Oblasts), but also have a rapport between two robust reformist politicians, one of whom in Mr Sadoviy, will run for president at the next elections on the back of his Samopomich Party infrastructure and can provide Mr Saakashvili with a like-minded reformist political safety net when the Poroshenko presidential axe inevitably falls – whether it be because there is success beyond expectation, or failure. Discounting political wild cards such as Valentyn Nalyvaychenko, it seems clear that the preferred presidential and parliamentary electoral showdown would be between President Poroshenko, or any Solidarity Party anointed successor, if as most believe, Mr Poroshenko will be a single term president – and Andrei Sadoviy and Samopomich. Whatever the case, there appears to be, if not a thorough deepening of ties (yet), then certainly a far greater interaction between Odessa and Lviv at a business, functionary/mandarin, and leadership level than can ever be recalled. Something to watch over the next year or more with a view to what is seemingly now a quietly revealed umbilical chord, turning into a safety net, or perhaps an EU bordering provincial power grid. Meanwhile, we can allow the Ukrainian media to focus minds on a somewhat minor storm in a very small teacup between Messrs Sadoviy and Samopomich, and Klitschko and UDAR – something that has potentially far less interesting repercussions than a genuine and strengthening Odessa – Lviv regional reformist agenda. Yesterday appears to be a day of progress perhaps, but no shortage of mutual backslapping with regard to constitutional change and “decentralisation”. “I want to congratulate all the members of the Constitutional Commission on the first decision that we made, I want to emphasize and to announce that we will continue our work you and we will continue to work out our proposals.” – Volodymyr Groysman, Speaker Rada. “The fact that I’m now expressing the position on the adoption is a proof that I will either partially or largely support the amendments and submit them to the parliament for consideration next week. We still have a chance, we have not lost our chance to vote for changes to the Constitution before the date of the local elections, before October 25. It’s very important that Donbas representatives take part in developing these constitutional amendments… It’s very important that numerous polls support our idea of complete unacceptability of the federalization. After these constitutional amendments on decentralization, Ukraine will remain a unitary state. And that’s why we can’t have any compromises. Decentralization will be ‘a shot from totalitarianism.” – President Poroshenko. Well, very good. Undoubtedly a somewhat sticky process as constitutional amendments normally are. Yet for all the talk, constitutional progress made, and whatever amendments are eventually adopted, aside from public domain generalisms, just what will “decentralisation” actually deliver to the regions? Undoubtedly “decentralisation” is a necessary and welcome move, but what exactly is the substance behind the form? What exactly are local constituents going to hold their local governments accountable for that they currently do not? What exactly are the envisaged responsibilities that will be moved from the centre to regional/local governance? Is it not time to move from broad brush stroke public “decentralisation” statements to a little more, or indeed a lot more, detail? Is it not now time to stop speaking in tongues and engage in some “clear-speak”? Odessa it is often said, is one of the most cosmopolitan cities in Ukraine – and it is. It has always been a cosmopolitan city throughout Greek, Roman, Ottoman, Tsarist, Soviet and contemporary times. That is nothing particularly unusual for major sea ports with centuries of history of course. Continual exposure to foreigners coming, going, and staying, over the aeons leave their mark. Throw in the fact that Odessa was a place of exile and/or hiding for those that fell out with the ruling elites during Tsarist and Stalinist times, and a city with a special place in the hearts of many Jews, and cosmopolitan is where you end up. Indeed, the last time a UK diplomat of lofty position visited your author, he commented that within the restaurant where we met were Turks, Syrians, Nigerians, Chinese, Indians, Americans, Ukrainians, Georgians, Armenians, Azerbaijan and ourselves. Something, he stated, you don’t see in Kyiv. Avoiding Kyiv like the plague, and going only under pain of death, how accurate that statement is your author cannot comment upon – but it was nonetheless made. Odessa is also now an Oblast with a governor that was once a President of Georgia, and a Police Chief in Giya Lordkipanidze, that was also a Georgian politician – albeit both are now citizens of Ukraine. Such is the cosmopolitan nature of the Odessits, the electorate has barely raised an eyebrow. In fact weeks after his appointment of governor, Mr Saakashvili is still asked to be in many a “selfie” with his constituents, as countless Facebook and VKontakte accounts continually bare testimony too. It is of the tasks, or indeed to one of the tasks, facing Giya Lordkipanidze this entry will address. He has claimed that he intends to make Odessa “the safest city in Ukraine”. A bold claim for a city that is almost perennially the host to the first political murder of the year in Ukraine. One of the first things he intends to do is to put all the AK weapons currently carried by the police back in the armoury. This, apparently to make the electorate feel more at ease with the police. Security guards/firms with AKs are a daily sight entering and leaving banks with those depositing or removing large sums of cash. Police with AKs are not any more scary – and it is not as though they all carry them. The sight of the police carrying AKs remain few and far between. If the intent behind the spate of bombings within the city over the past year or so was meant to scare the populous, it failed – and failed miserably. Police carrying AKs also fail to scare the locals. To be frank, nobody is bothered by them, other than the tourists perhaps. It seems little more than a “high visibility policy change” for the sake of form, rather than necessary substance. Anyway, aside from making Odessa the “safest city in Ukraine”, forming a new metropolitan force similar to that in Kyiv, and notwithstanding the chronic corruption within the ranks, eventually Giya Lordkipanidze will have to deal with the few hundred swivel-eyed loons from Kulikovo Pol sect, and the swivel-eyed far right nationalists – neither of which it has to be said, have much, if any genuine societal support and hence their number is of a few hundred between them. Indeed, in true Odessa cosmopolitanism, of the numerous splinter groups on either side, all with differing swivel-eyed deformed visions of the future, and representing nobody other than themselves and their own warped ideologies, of the swivel-eyed Kulikova Pol side, currently one of the most prominent leaders is a Lebanese Marxist who moved to Odessa just in time for the collapse of the USSR. One of the leaders of the most prominent swivel-eyed nationalist right is a barrel-chested man who hails from Cherkasy. Thus Odessa will eventually see a native Georgian police chief have to reign in the collective nuttery and continuing illegal actions of a Lebanese Marxist and followers seeking an impossible return to a Communist/Soviet past, and an equally delusional native of Cherkasy Oblast and his small band of merry men of nationalist fervor, seeking a future that is equally unattainable and undesirable. Nowhere amongst either (albeit tiny) group will the definition of patriot be found – nor do they represent of the overwhelming majority. That neither group have been written about for some considerable time here is because the only people to take any notice of them are themselves, journalists looking for an “extremist” story, and the security services – and it is debatable just how much attention either side are getting from the security services considering their on-going illicit activities. It is very unlikely there will be another entry on this subject for some considerable time until Giya Lordkipanidze gets around to reigning them in, or one or other side does something so incredibly stupid that it simply cannot be ignored due to significant societal impact. Until any of that occurs, they will continue to play amongst themselves, continue to break the law, and continue to be entirely ignored by everybody else. 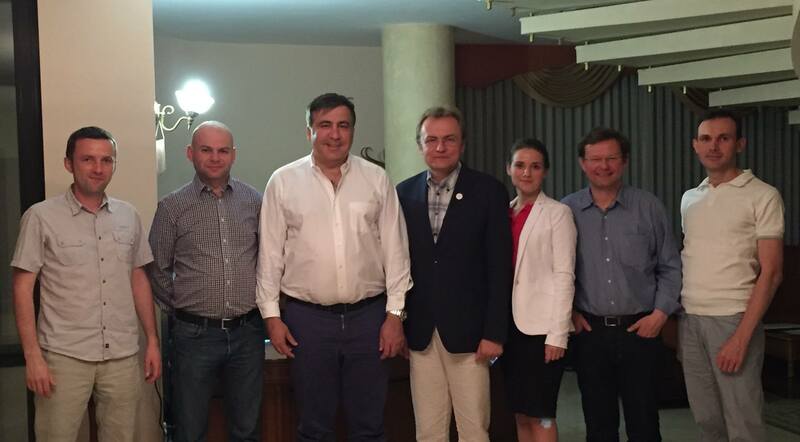 Governor Saakashvili has refused to meet either group despite requests being made – and quite rightly. Until either act consistently within the law, they should not be given an official audience. It falls to Giya Lordkipanidze, the new city police chief, together with the SBU to reign them in. Should he manage to do so, and they consistently act within, rather than without, the law, then perhaps they will get to see the governor – not that any governor is about to deliver (or could deliver) either side their delusional aspirations to the detriment of the wishes of the overwhelming number of constituents. There is a longstanding saying in Odessa that “Ukraine is Ukraine, but Odessa is Odessa” based upon the city having always been far more cosmopolitan, and thus different, to the “whole” – whatever the “whole” was, and whomever was ruling it at the time. Once again there will inevitably be an “only in Odessa” moment when a native Georgian (acting for the overwhelming majority) takes on a Lebanese Marxist and a Cherkasy native. Even amongst the swivel-eyed, cosmopolitanism is an Odessa trademark it seems. A long time ago, the first of many entries was published following the presidential signing of what was, and remains, a very poorly crafted “Lustration Law” – better known as the “Law on purification of the government”. To read more upon the blog predictions and, as predicted, the results of this law, simply put “Lustration Law” in the search facility of the blog. There are far too many links to put in this entry. Indeed, the above link quotes President Poroshenko stating, “I’ve thoroughly studied the draft Law “On Purification of Government” in the version that has been adopted by the Verkhovna Rada the last week. It is not flawless. It has a lot of problematic moments. A lot of innocent people will have to go through a humiliating procedure. I am not happy with that. I’d wish for the better. But in current circumstances, the Law will be signed. Whatever the case, and whatever the on-going problematic outcomes, many of which will end up at the ECfHR, the president signed the law, despite acknowledging its extremely flawed text. So be it. Knee-jerk legislation today, decidedly expensive recompense and unwanted ECfHR headlines tomorrow. Nevertheless, the law of the land is the law of the land – even if the law of the land if awful and fraught with future (yet avoidable when drafting) problems. Taking into consideration the inability of the overwhelming majority of Ukrainian lawmakers to craft anything like decent legislation, together with a then still very volatile public demanding to see the old corrupt elites and functionaries removed from positions of power, the spirit behind the law – not to the mention political fear (and no shortage revenge) that drove it through the Rada – is perhaps understandable. When thinking about law making, the first question is always “is it necessary?”. If it is not necessary then it need not exist. The moment that a Ukrainian government actually goes through the existing statute and begin repealing a whole tome of unnecessary and/or Soviet inherited legislative nonsense cannot come too soon. Which is more important, toppling statues of Lenin or toppling Soviet and nonsensical legislature to which we are all supposed to conform? Thereafter there are probably two tests above all others relating to any law/proposed law. The first and most obvious is whether the law advances justice for all. If yes, OK – if not then it fails to advance justice and should not be adopted. The next question is whether any new law/proposed law that would advance justice for all, would adversely effect the most basic and fundamental of human rights in doing so. If yes it fails – if not then OK, bring it to the statute book. Until any new law meets the “necessity” requirement, and passes the above two, admittedly but deliberately broad tests, then it is not fit for statute. The aim is rule of law – it is not rule by law. For rule of law to succeed, society must deem any law both necessary and fair or it will be ignored to the point of being effectively unenforceable when broken on a grand scale repeatedly. As President Poroshenko acknowledged on the record that he was signing into law a decidedly poorly crafted law, rather than returning it to the Rada with a few suggestions, or vetoing it, then he has to shoulder his share of the blame for the “Lustration Law” being awful. He also cannot claim anything other than an intricate knowledge of the law having clearly stated it was in effect poor but better than nothing. The president however, must also be mindful of both his constitutional obligations and his constitutional limitations. The Ukrainian constitution is clear about the responsibilities of the president vis a vis the Cabinet of Ministers and parliament. Every effort should be made to keep those defining lines as clear as possible. President Poroshenko should not be encouraged, nor be allowed, to cross the constitutional lines or wantonly break any laws of the land. That is particularly inglorious when he signed those law of the land into being. Having signed a law on lustration, the president has now appointed a recently lustrated individual to the office of Chief of Investigative Department of the SBU – This despite the ban on holding public office for those lustrated being clearly defined within the “lustration law” that he signed despite his reservations. Mr Ostafiychuck was subjected to lustration, failing the lustration tests having been unable to account for just how he and his family came to own a lot of property and have several million in unexplained income from a Ukrainian functionary’s salary. Thus failing the lustration test at the hands of the Public Lustration Committee, he was duly removed from office and subsequently banned from holding public office for many years to come – or not it now appears. Aggravating matters even more, Mr Ostafiychuck should, and did, undergo a “lustration check” prior to being appointed – this check not being the responsibility of the Public Lustration Committe but that of the prosecutors office. Seemingly the prosecutors office are not that concerned about just how Mr Ostafiychuck and family came to have so much property and money that he cannot account for. In short, appointing Mr Ostafiychuck is nothing short of a stunning and brazen disregard for a law that the president himself brought onto the statute books of Ukraine. Justice is deliberately blind. It is not meant to have one eye open for political expediency. It is entirely irrelevant whether Mr Ostafiychuck is the best individual for the SBU post to which he has now been presidentially appointed. He may very well be (though that is doubtful). The law states he cannot hold that office. Thus he should not hold that office and the president, if he is to lead by example, has now to make the moral decision to quash that appointment – even if it undermines his ever more obvious power vertical. It is sad enough to watch, in particular, the Prime Minister shoehorn in equally nefarious/corrupt acquaintances back into governmental positions, and also to continue to watch meritocracy sacrificed on the alter of party quotas for positions of power, without the president so openly and brazenly casting aside the rule of law – and a law he signed into statute. The root cause of almost every ill in Ukraine is the absence of rule of law. It won’t be long before the external and influential supporters of Ukraine begin seriously looking for alternative leaders to promote within the public realm should both President and Prime Minister continue to flagrantly ignore the laws they both bring into being. That the Ukrainian government plans to privatise, and thus shift a lot of loss making, or subsidies taking, State controlled assets from the government books is no secret. Amongst the headline ticket items for privatisation are assets (or liabilities) such as Odessa Port Side (cue oligarch’s Kolomoisky and Firtash), and Centrenergo. Odessa Port Side is indeed worth buying. It makes nitrogen fertilisers and has sales in US$ hundreds of millions. If a Kolomoisky-Firtash show down occurs over what really is a decent asset, Ihor Kolomoisky would be favourite to win – this for two reasons. Firstly because he has far better cash flow than Mr Firtash currently, and secondly due to his influence within Prime Minister Yatseniuk’s party which he backed heavily. However, with this asset there is likely to be some foreign interest too, simply due to it being a very decent asset amongst what is otherwise a whole host of governmental liabilities going up for sale. There is but one cloud in an otherwise blue sky surrounding the privatisation of Odessa Port Side. That cloud relates to an on-going dispute between Odessa Port Side and РГК Трейдинга (RGK Traiding), a company owned by Dmitry Firtash, that for many years held the contract to supply Odessa Port Side with gas. That contract ended just after his pursuit by the US for corruption began and thus his being marooned in Austria. During those first months Odessa Port Side switched gas suppliers from Mr Firtash’s РГК Трейдинга (RGK Traiding) to the German company Eon. РГК Трейдинга (RGK Traiding) subsequently submitted a claim for UAH 1.39 billion against Odessa Port Side relating to unpaid gas bills between April and June, to Odessa Regional Economic Court. The actual debt for gas claimed is UAH 1.237 billion in relation to 217 million cubic meters of gas. The remainder of the claim relating to to penalties incurred. Odessa Port Side refutes those claims. As yet it appears that this issue remains unsettled. One naturally hopes that a foreign company would be successful over the Ukrainian oligarchy for reasons of internal and external messaging, and the limiting rather than expansion of the oligarchical power over the domestic economy. There is far more to consider with privatisation than simply who will pay the most money, no differently to awarding a tender to a bidder cannot fail to consider far more than the price submitted. Would that be a “Ukrainian advisor” or a reputable advisor? Quite why Centrenergo is deserving of a “an advisor” whilst Odessa Port Side is not may be due to several reasons. Firstly, there may be a grubby agreement between Ihor Kolomoisky and the Prime Minister that he will get Odessa Port Side – so why involve an external advisor who will be ignored and may then go public with matters that some would prefer to remain behind the curtain. Odessa Port Side is also a money making and not subsidy taking entity. It is therefore an easier sell (unless a buyer is looking for a currently loss making entity for tax reasons), so it may be deemed there is no need for “an advisor“. Another obvious reason is that Odessa is not a war zone – an issue that cannot be ignored with the production units of Centrenergo. Centrenergo is the second largest thermal generator by capacity in Ukraine at about 7550 MW – but its generation sites are spread across Kyiv, Kharkiv and Donetsk. Two of these production sites were built in the 1970s to burn anthracitic coal which is mined in The (occupied) Donbas. There happens to be a war occurring in Donetsk and the wider Donbas. That said, anthractic coal can be imported. Costly conversions to exiting industrial plant infrastructure can be made if the purchase price reflects such required modernisation investment. Rinat Akhmetov and his SCM vehicle seem highly unlikely to buy despite this being very much “up his ally”. He, like Mr Firtash, currently has cash flow issues. There is rumour that the French GDF Suez, and a few other foreigners, are interested, so perhaps the issues listed above are not enough to put off serious investors. Indeed what is most likely to put off most serious investors is the absence of reform in the Ukrainian energy sector as a whole. The government will need to reform and transform the energy sector to allow new owners the room to turn these entities around and make a profit under sound management and market conditions. Quite what value the Cabinet of Ministers puts on its 78.3% share of Centrenergo remains to be seen. It may well be that the value of the 78.3% State share is perceived as less than the costs of subsidies/loses. There are some very hard political and economic choices to be made when selling off State assets that have relied on subsidies/made loses consistently. To get such subsidy eating/loss making entities off of the government balance sheet is probably more important than the revenue income from the actual sales – the news headlines will not be kind and the existing monopolies will provide robust resistance. Will the government have the political will to do what is necessary? Centrenergo is going to be something of an energy bellwether, not so much in its actual privatisation (if it happens), but what need happen around its sale to turn it into an asset worth buying as a business with a potentially profitable future. So, to Centrenergo or not to Centrenergo? – That is the question, for it is a question about far more than simply flogging off a State asset to any/the highest bidder. You are currently browsing the Odessablog's Blog blog archives for June, 2015.